The Government encourages people to use solar energy by offering incentives to Australian home and business owners. Read on to find out more about these rebates and incentives. Or contact our solar experts today on (08) 9303 9810. Upfront discount– STCs are assigned to a registered solar agent when your PV system is purchased. The STCs reduce the cost of your system. 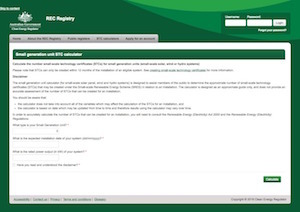 Selling on the REC – The REC is the Renewable Energy Certificate Registry. This is where people buy, sell and transfer STCs. To do this, people must create the STC first. Most consumers choose to use STCs to reduce the upfront costs of installation. The value of STCs is based on the supply and demand, they have been as low as $18 and as high as $40. Click the image below of follow this link to the state governments STC calculator to find out how many STCs you are entitled to. Extra electricity generated by your solar PV system can be reimbursed to you via a feed-in tariff. As of 2012, Perth’s feed-in tariff was 7.13 cents per kilowatt that is fed back into the grid. In the 2017 to 2018 financial year, businesses can write off assets – including solar power systems – to the value of $20, 000. This tax reform applies to business with a turnover of less than $10 million per year.